On the outskirts of the city you'll find the Parque Eduardo VII; a beautifully, well kept park. At the top of the park there's a balcony which gives a truly unique view of Lisbon. Looking straight down the hill you can see the Monument to the Marquis of Pombal. On a clear day you can also see straight down the main road Avenue da Liberdade which leads directly into the centre of the city. Price to visit: Absolutely free! Still slightly on the outskirts of the city is the terrace Miradouro de Sao Pedro de Alcantara. It gives great views over the city, and you can just about see Castelo de Sao Jorge in the distance. One thing to note was when I visited in July 2017, there was a temporary high fence up whilst construction work was taking place nearby. Hopefully it won't be there for too much longer! Price to visit: Completely free if you walk to it, or if you fancy taking the Ascensor da Gloria (a funicular) up to the terrace a return ticket costs £3.70. One of the main attractions for visitors in Lisbon is the Santa Justa lift. It's such a unique piece of architecture and takes you up to the higher level of the city for amazing panoramic views. Be warned though - it gets very busy! Try to visit earlier in the day to avoid the queues. We visited at 9:30am and there wasn't a line at all. Fast forward to 11am though and the queues were huge! Price to visit: A ticket for both the lift + the observation deck costs €5.15. However, if you have the 24-hour public transport Metro card the price of the lift is included and you only have to pay €1.50 to visit the observation deck. Potentially my favourite views of Lisbon are found at the top of the Arco da Rua Augusta - the incredible arch that can be found in the main square. As well as views of the city, you can see all the way out across the river and to the Golden Gate-style bridge. Price to visit: €2.50 for a ticket. Although this terrace is one of the smaller ones in Lisbon, it's still a beautiful spot. It's not as high up as others are, which means you can see the details of the individual buildings whilst still looking over the traditional red roofs. A must-do whilst exploring Lisbon is visit the Sao Jorge castle! Not only is it an impressive Moorish castle, it's also a great spot for views over the city. Don't worry if you haven't pre-booked your tickets, the queue goes fairly quickly and it's definitely worth the wait. Price to visit: Tickets cost €8.50 for adults, or €5 for students. Only a short walk from the castle is the terrace Miradouro da Graca. It gives amazing views over the city and of the castle, and if you're lucky a local street performer will be playing live music on a nearby bench. It's a lovely place to take a short break, and give your feet a rest from all that walking around the city. A similar terrace to number 7 that gives lovely views of the castle is Miradouro da Senhora do Monte. It's right next to a beautiful Catholic church and is a lovely place to stop and have a drink. On the other side of the city in the Belem district is the Discoveries monument. It's over 50 metres tall, and visitors can take a lift to the very top. The monument gives awesome views over the Jeronimos Monastery, as well as the entire city. Price to visit: Entry costs €4 for adults, or €2 for students. 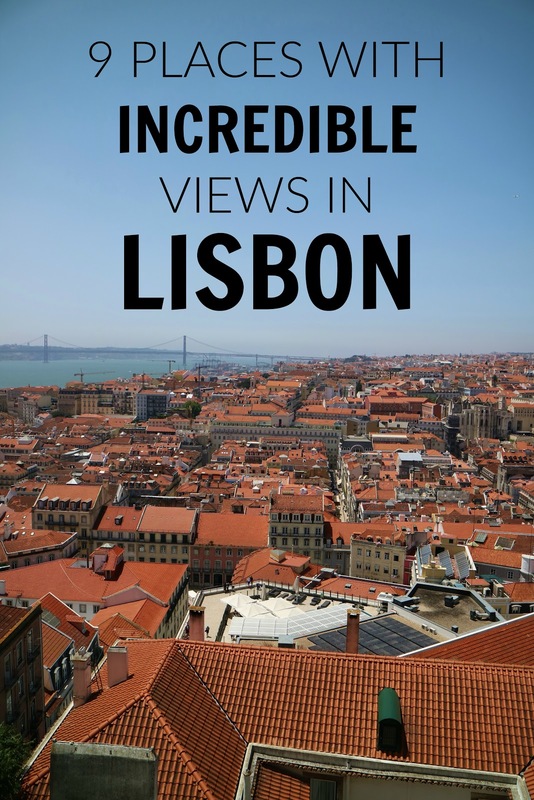 Do you know of any other places with good views in Lisbon?